The Flatland Digital Artwork Clip Art Gallery: Reminders. This one---one of my favorites---is hard to describe. 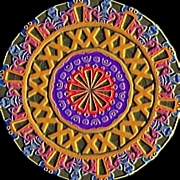 A 3 dimensional image of a seal: central image is a carved circle in carnelian red with a carved asterisk, surrounded by an outer ring in hot purple. This is surrounded by another ring in bronze and copper and an outer rim in blue and magenta.